When I was a boy I could be playing tag with my cousins, skipping rocks with my buddy Jeff Sanford, or walking through Dahlonega during Gold Rush Days, but if I heard a banjo I stopped what I was doing and listened. I don’t know what it is about a banjo. It’s mesmerizing. I’ve seen old men in bib overalls stand for hours, patting their foot with a quiet grin on their face as they listened to a good banjo picker. Earl Scruggs, with his three-finger picking style, captivated hillbillies from Virginia to Alabama and beyond. He passed away March 28, 2012, but not before inspiring millions and making a mark that will never be forgotten. We mow it. We water it. Heck, we fertilize it, pull weeds out of it, edge it, and spray it, but when’s the last time you laid down in it? I don’t mean sit on a blanket spread over it. I don’t even mean lying on your back with your hands behind your head staring up at the clouds on it. I mean belly down lying, like when you was a little boy or girl. I mean rolling down a hill on it till you itch from head to toe. He held up a small cup for me to look into, smiled a big toothy smile, and said, “I found 17 four leaf clovers,” and I missed being a boy. I was just a blond headed boy who didn’t know or care too much about the world outside of Gordon County, but I knew when Bob Horner was putting on too much weight and needed to be traded. I knew when Biff Pocoroba’s knees were so worn out that he’d finish third in a race with a pregnant woman. My grandfather believed with all his heart that Atlanta was going to hell in a hand basket. He didn’t even care to drive through that city, but from spring until fall he connected himself to Fulton County Stadium via WSB 750 on the AM dial. AM radio was meant for two things in my grandfather’s home: gospel music and Braves baseball – both divine gifts to man from God himself. If you so much as touched the dial or bumped the antenna on that old GE radio you risked being struck. He could be clearly unconscious, feet up and mouth agape in his old recliner, but if the signal was suddenly interfered with he was prone to strike out like a cornered rattler. Careless grandkids were most at risk. All this talk about Chipper retiring got me to thinking about Braves baseball. Back in the baby blue days, when Chief Nock-A-Homa ran through a sparsely populated stadium, you could buy general admission tickets and find a seat on the 1st or 3rd baseline without much trouble at all. Pa mostly complained in those days. They could never put a roster together that satisfied him, until 1976. 1976 was a big year for folks in Georgia. A peanut farmer from Plains was elected as the President of the United States. The city was buzzing because Jimmy’s son Jack lived in Calhoun and Burt Lance was going to Washington to be the Director of OMB. Suddenly, everyone wanted a connection to those running the nation, but truth be known most of our people had more in common with Billy than with Jimmy. It was a bicentennial year and an exciting time to live, but for Pa it was the year the Braves signed Dale Murphy. No finer man has ever graced the Atlanta Braves dugout than Dale Murphy. “People keep looking for words to describe him. Well, there aren’t enough good words or words good enough,” Phil Niekro said of Murphy. Don Sutton said, “Dale may be the only guy I know who could call twenty-four guys in one locker room a good friend.” Dale Murphy was a class act and Atlanta fell in love with him, but even he couldn’t bring a pennant to Atlanta. 1980 was a rough year — too tough for Pa to handle. Phil Niekro became the first National League pitcher to lead the league in losses for four consecutive seasons. They had a memorable group of players that year: Chambliss at 1st, scrappy little Glen Hubbard at 2nd, Ramirez at short and Horner rounding out the infield at 3rd. They wound up in the middle of the pack, but it cost Pa more Evan Williams than his liver could stand. He left a gold Braves watch behind – one given to him by a co-owner. He died during a slump with no idea of what the 90s would bring. Still, we have so many fond memories of the lean years. We’ll never forget that 1982 season when Pascual Perez was scheduled to start, but instead got lost and drove three laps around Atlanta on I-285 until his rental car ran out of gas. We’ll never forget Aaron’s 715th dinger over the left-center field wall, and I’ll always smile when I picture a semiconscious old man grinning with his eyes closed after Murphy sends a 3-2 pitch for a ride to the upper deck. I have so many memories of the Fair. Some might find that odd, others depressing. 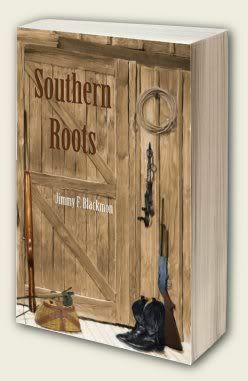 Some would even find it stereotypically Southern and quite fitting, but it’s true. Heck, it’s been around since 1931, so I can’t be alone in this. I remember little Dia Clark clogging at the Fair. I remember the Pageant from toddler to Miss. I remember the animals and especially their stench if you went late in the week. I recall the M-60 tanks from the National Guard Armory and my fascination with them being made completely from steel. I remember performing at the Fair when I was older. In black slacks, a tux shirt, complete with cummerbund and bowtie, our Show Choir sang and danced to hits from Broadway and the Silver Screen, which might have been out of place; like Andy Griffith quoting Shakespeare. I remember one year particularly well. An extra day was tacked on. The Fair began on Monday, after a parade through town, and as the Calhoun Times forecasted, “a bevy of Southern belles and beaus,” were to be found at the Fair grounds throughout the week. It was 23 years ago – 1989. I had finished my sophomore year in college and was home for the summer. The fair had lost some of its luster by then. I was too old to be captivated with throwing baseballs at plates and trying to knock over lead-filled bowling pins. I bumped into India Medders that year, her being home from school as well. I told her I planned to see a movie that night and invited her to go. We saw Dead Poet’s Society and I recall pretending that my eye was itching when all the boys stood on the desk and proclaimed “O Captain! My Captain!” I was taken by the movie; so much so that I visited a bookstore the following day and bought 100 Greatest Poems ever written, which still sits on my shelf today. Through that book I found the Irishman Yeats. I found Whitman, Barrett Browning, Wordsworth, Tennyson and Dickinson to name but a few. I found poetry that I loved and poetry that vexed me to say the least. But once again my discovery all began at the County Fair. 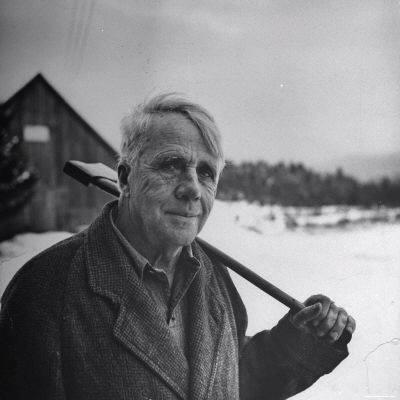 There are many wonderful photographs of Robert Frost. There are those that capture him in his youth, others in old age. There are pictures that capture him posing deep in thought and yet others intently observing what he wrote so eloquently about – nature and his surroundings. This is my favorite picture of Robert Frost. A still black and white shows Frost with an axe in his hand, resting upon his shoulder. It demonstrates that he, a man who penned delicate lines on paper, swung an axe with calloused hands. The ground between him and the barn is covered with snow. 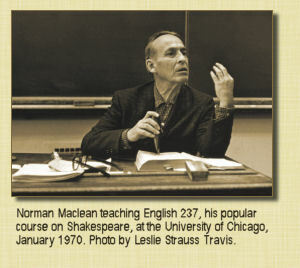 It demonstrates to me that he knew his environment. 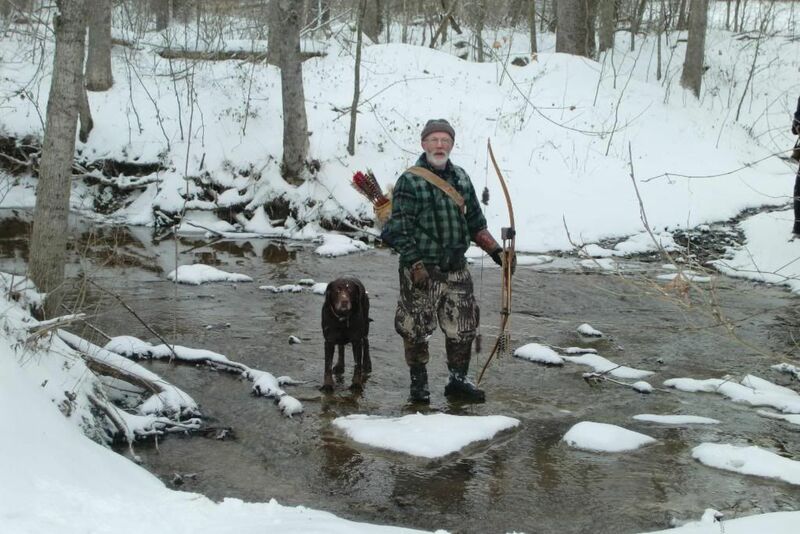 He walked in the “yellow wood.” He tried to silence a “minor bird,” and he prayed in spring. 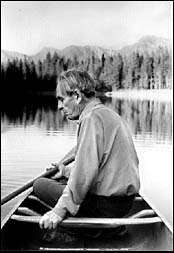 It demonstrates to me that Robert Frost lived! 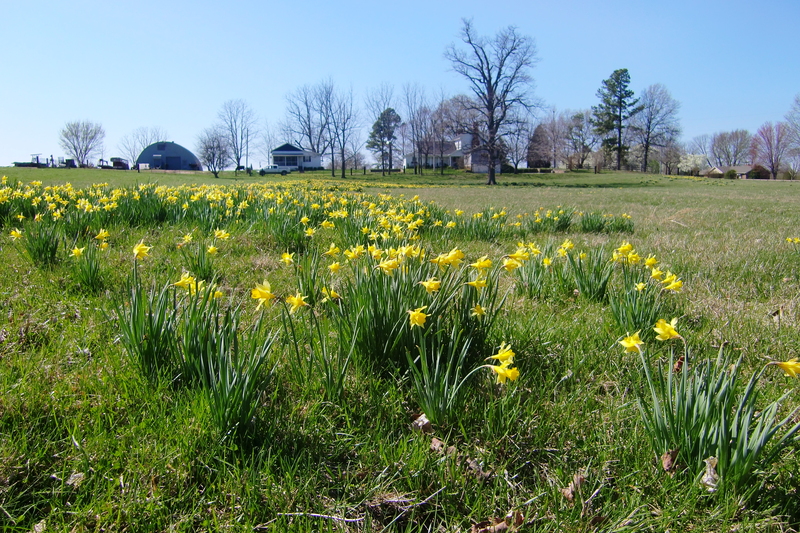 Today is the vernal equinox – the first day of spring in 2012. What better way to welcome spring than with Frost? It felt like spring today as I ran down Pace road in the quiet of morning, sun bright and birds singing. I guess it’s a sign I’ve had enough winter. I passed by Ol’ Man Davis’s pond and saw a red-winged blackbird land on a cattail. I was transported back to a simple time, a time when I squatted by a pond wondering how spiders could walk on water and where the world might take me some day. 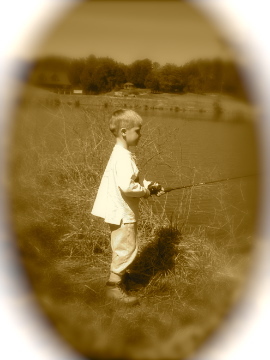 A time when I fished with worms found under stacks of roofing tin, basement crickets, grasshoppers, and anything else I could catch and put on a hook. Lying back on a grassy bank, staring into an endless blue sky as the sun warmed my skin, put everything into perspective. I was but a speck of dust in the universe. I wondered where Heaven might be, then my bobber would bounce, I’d set a hook, and just like that I found my Heaven. I am ready for spring. I’m ready for the hills to dress themselves in color again, ready for jonquils, azaleas and Queen Anne’s lace. On down the road twenty-five Tom turkeys stretched their necks high in the air as I ran by, disturbed from pecking out a breakfast in Ol’ Man Davis’s pasture. They eat his calves’ feed and he says, “Kill um’ all Jimmy. Kill ever last one of um’,” and I’m obliged to – come spring.